"Promoted" redirects here. For the 2015 film, see Promoted (film). Swansea City have played in all fully professional divisions of the English football league system. Their history shows how teams can move quickly between the levels through successive promotions or relegations. In sports leagues, promotion and relegation is a process where teams are transferred between multiple divisions based on their performance for the completed season. The best-ranked team(s) in the lower division are promoted to the higher division for the next season, and the worst-ranked team(s) in the higher division are relegated to the lower division for the next season. In some leagues, playoffs or qualifying rounds are also used to determine rankings. This process can continue through several levels of divisions, with teams being exchanged between levels 1 and 2, levels 2 and 3, levels 3 and 4, and so on. During the season, teams that are high enough in the league table that they would qualify for promotion are sometimes said to be in the promotion zone, and those at the bottom are in the relegation zone (or, colloquially, the drop zone or facing the drop). An alternate system of league organisation which is used primarily in the US and Canada is a closed model based on licensing or franchises. This maintains the same teams from year to year, with occasional admission of expansion teams and relocation of existing teams, and with no team movement between the major league and minor leagues. The number of teams exchanged between the divisions is almost always identical. Exceptions occur when the higher division wishes to change the size of its membership, or has lost one or more of its clubs (to financial insolvency or expulsion, for example) and wishes to restore its previous membership size, in which case fewer teams are relegated from that division, or (less often) more teams are accepted for promotion from the division below. Such variations usually cause a "knock-on" effect through the lower divisions. For example, in 1995 the Premier League voted to reduce its numbers by two and achieved the desired change by relegating four teams instead of the usual three, whilst allowing only two promotions from Football League Division One. Even in the absence of such extraordinary circumstances, the pyramid-like nature of most European sports league systems can still create knock-on effects at the regional level. For example, in a higher league with a large geographical footprint and multiple feeder leagues each representing smaller geographical regions, should most or all of the relegated teams in the higher division come from one particular region then the number of teams to be promoted or relegated from each of the feeder leagues may have to be adjusted, or one or more teams playing near the boundary between the feeder leagues may have to transfer from one feeder league to another to maintain numerical balance. The system is said to be the defining characteristic of the "European" form of professional sports league organization. Promotion and relegation have the effect of allowing the maintenance of a hierarchy of leagues and divisions, according to the relative strength of their teams. They also maintain the importance of games played by many low-ranked teams near the end of the season, which may be at risk of relegation. In contrast, a low-ranked US or Canadian team's final games serve little purpose, and in fact losing may be beneficial to such teams, yielding a better position in the next year's draft. Although not intrinsic to the system, problems can occur due to the differing monetary payouts and revenue-generating potential that different divisions provide to their clubs. For example, financial hardship has sometimes occurred in leagues where clubs do not reduce their wage bill once relegated. This usually occurs for one of two reasons: first, the club can't move underperforming players on, or second, the club is gambling on being promoted back straight away and is prepared to take a financial loss for one or two seasons to do so. Some leagues (most notably English football's Premier League) offer "parachute payments" to its relegated teams for the following year(s). The payouts are higher than the prize money received by some non-relegated teams and are designed to soften the financial hit that clubs take whilst dropping out of the Premier League. However, in many cases these parachute payments just serve to inflate the costs of competing for promotion among the lower division clubs as newly relegated teams retain a financial advantage. In some countries and at certain levels, teams in line for promotion may have to satisfy certain non-playing conditions in order to be accepted by the higher league, such as financial solvency, stadium capacity, and facilities. If these are not satisfied, a lower-ranked team may be promoted in their place, or a team in the league above may be saved from relegation. While the primary purpose of the promotion/relegation system is to maintain competitive balance, it may also be used as a disciplinary tool in special cases. On several occasions, the Italian Football Federation has relegated clubs found to have been involved in match-fixing. This occurred most recently in 2006, when the season's initial champions Juventus were relegated to Serie B, and two other teams were initially relegated but then restored to Serie A after appeal (see 2006 Serie A scandal). In some Communist nations, particularly several in Europe after World War II, clubs were promoted and relegated for political reasons rather than performance; clubs in East Germany, Romania, and Yugoslavia were given top-flight placements by the Communist authorities from their beginnings, and often held onto their places with these authorities' backing. This was made evident in the late eighties especially by teams such as Romanian Steaua București and Yugoslav Red Star Belgrade, both winners of the European Champions League despite the rampant level of corruption in their Communist local leagues. Promotion and relegation may be used in international sports tournaments. In tennis, the Davis Cup and Fed Cup have promotion and relegation, with a 'World Group' (split into two divisions in the Fed Cup) at the top and series of regional groups at a lower level. The World Groups in both use a knockout tournament format, with the first-round losers entering play-offs with winners from regional groups to avoid relegation. In international tournaments, this format allows teams from countries in which a sport is less well established to have competitive matches, while opening up the possibility of competing against higher ranked nations as a sport grows. 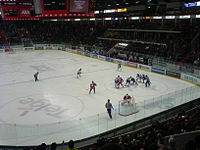 Other international tournaments which employ promotion and relegation include the Ice Hockey World Championships, Bandy World Championships, Floorball World Championships, the UEFA Nations League, the World Cricket League and the European Team Championships in athletics. In baseball, the earliest American sport to develop professional leagues, the National Association of Base Ball Players (NABBP) was established in 1857 as a national governing body for the game. In many respects, it would resemble England's Football Association when founded in 1863. Both espoused strict amateurism in their early years and welcomed hundreds of clubs as members. Baseball's National Association was not able to survive the onset of professionalism. It responded to the trend — clubs secretly paying or indirectly compensating players — by establishing a "professional" class for 1869. As quickly as 1871, most of those clubs broke away and formed the National Association of Professional Base Ball Players (NAPBBP). That new, professional Association was open at a modest fee, but it proved to be unstable. It was replaced by the National League of Professional Base Ball Clubs in 1876, which has endured to the present day. The founders of the new League judged that in order to prosper, they must make baseball's highest level of competition a "closed shop", with a strict limit on the number of teams, each member having exclusive local rights. The modest National League guarantee of a place in the league year after year would permit the owners to monopolize fan bases in their exclusive territories and give them the confidence to invest in infrastructure, such as improved ballparks. In turn, those would guarantee the revenues to support traveling halfway across a continent for games. Indeed, after its first season, the new league banked on its still doubtful stability by expelling its members in New York and Philadelphia (the two largest cities), because they had breached agreements to visit the four western clubs at the end of the season. The NL's dominance of baseball was challenged several times but only by entire leagues, after its first few years. Eight clubs, the established norm for a national league, was a prohibitively high threshold for a new venture. Two challengers succeeded beyond the short-term, with the National League fighting off a challenge from the American Association after a decade (concluded 1891). In 1903 it accepted parity with the American League and the formation of the organization that would become Major League Baseball. The peace agreement between the NL and the AL did not change the "closed shop" of top-level baseball but entrenched it by including the AL in the shop. This was further confirmed by the Supreme Court's 1922 ruling in Federal Baseball Club v. National League, giving MLB a legal monopoly over professional baseball in the US. In contrast to baseball's NABBP, the first governing body in English football survived the onset of professionalism, which it formally accepted in 1885. Perhaps the great geographical concentration of population and the corresponding short distances between urban centres was crucial. Certainly it provided the opportunity for more clubs' developing large fan bases without incurring great travel costs. Professional football did not gain acceptance until after the turn of the 20th century in most of Southern England. The earliest league members travelled only through the Midlands and North. When The Football League (now the English Football League) was founded in 1888, it was not intended to be a rival of The Football Association but rather the top competition within it. The new league was not universally accepted as England's top-calibre competition right away. To help win fans of clubs outside The Football League, its circuit was not closed; rather, a system was established in which the worst teams at the end of each season would need to win re-election against any clubs wishing to join. A rival league, the Football Alliance, was formed in 1889. When the two merged in 1892, it was not on equal terms; rather, most of the Alliance clubs were put in the new Football League Second Division, whose best teams would move up to the First Division in place of its worst teams. Another merger, with the top division of the Southern League in 1920, helped form the Third Division in similar fashion. Since then no new league has been formed of non-league clubs to try to achieve parity with The Football League (only to play at a lower level, like independent professional leagues in American baseball today). For decades, teams finishing near the bottom of The Football League's lowest division(s) faced re-election rather than automatic relegation. But the principle of promotion and relegation had been firmly established, and it eventually expanded to the football pyramid in place today. Meanwhile, The FA has remained English football's overall governing body, retaining amateur and professional clubs rather than breaking up. Promotion and relegation has been used in several eSports leagues. In the World Cyber Games realm, Blizzard Entertainment's video game StarCraft II: Wings of Liberty uses a seven-level promotion and relegation system for its tournament structure. Individual players and pre-made teams can be promoted and relegated during the first few weeks of a league season, which generally lasts around 11 weeks, with promotion and relegation taking place based on a hidden skill rating, which is in turn based on wins and losses. The most professional League of Legends leagues like the League of Legends Championship Series and League of Legends Champions Korea use a promotion and relegation system. The Counter-Strike: Global Offensive Majors use a similar system wherein the top eight finishers of one of the tri-annual Majors are designated with the "Legends" seed and automatically qualified for the next Major tournament. The bottom eight teams must play in a qualifying tournament in order to compete at the next Major. From 1993 until 2003, the Eurovision Song Contest used various systems of relegation to reconcile the number of countries wishing to participate (approximately 30 at the time) with the number of performances allowed considering time constraints of a live television program. The addition of a semi-final in 2004 allowed for more than 26 songs, but in 2008 automatic qualification of the previous year's top 10 to the final was removed. From 1957 to 1966 and from 1983 to the present, the Argentine First Division has used a system called Promedios based on the average performance over a number of seasons. Originally the previous two seasons, and later three or four seasons, clubs avoid relegation by having a high coefficient, which is obtained by dividing the points achieved in the last three seasons by the number of matches played in the same period. Teams with the lowest points coefficient at the end of the season are relegated to the Primera B Nacional. This system has both positive and negative aspects, since all of the matches played for the championship in the last seasons are included in the coefficient for the clubs. Teams have an incentive to score points in every match of the season, meaning teams that are not challenging for the title or fighting relegation in the current season want to win even in the final matches to reduce the risk of relegation in the next season; examples are Club Atlético Banfield being champion of the Torneo Apertura in 2009 and last place in the next championship, the Torneo Clausura 2010, without being relegated until the end of the Torneo Apertura 2010 with a second-to-last place finish. Similarly, River Plate finished last in the Torneo Apertura 2008 and after two bad campaigns and a regular one was relegated in the Torneo Clausura 2011 despite being in fifth place and qualifying for the 2011 Copa Sudamericana. This system forces the newly promoted teams to fight relegation from the very beginning of the season. It also allows teams with a low budget with previous good campaigns to compete in international competitions without having to prioritize the championship to avoid relegation; examples of this are Club Atlético Lanús, winner of the 2013 Copa Sudamericana, or Club Atlético Talleres, winner of the 1999 Conmebol Cup. The Uruguayan First Division adopted the same system in 2016. ^ "We WILL beat the drop! Kean confident struggling Rovers will win relegation fight". MailOnline. The Daily Mail. 5 April 2012. Retrieved 16 June 2012. Blackburn boss Steve Kean is convinced his side will avoid relegation this season despite Rovers slipping back into the drop zone. ^ Both were associations of clubs despite their names. ^ At least one economically and competitively viable incumbent was excluded, the second of three 1875 clubs in Philadelphia. ^ For comparison, the distance between Boston and St. Louis, the longest road trip in Major League Baseball before 1953, is similar to that between Madrid and Frankfurt, or Rome and Amsterdam. ^ To emphasize this point, compare England with Texas. Today, England's population is twice that of Texas, with slightly less than one-fifth of Texas' land area. ^ The modern regions that encompass the Midlands and North—the East Midlands, West Midlands, North East England, North West England, and Yorkshire and the Humber—have a combined land area slightly larger than that of West Virginia, Latvia, or Lithuania. ^ "StarCraft II Ladder, League, and Season FAQ". StarCraft II. ^ "La historia de los promedios en el fútbol argentino: cómo y cuándo se inventaron | Goal.com" (in Spanish). Retrieved 30 January 2018. ^ "La verdadera historia de la creación de los promedios". Infobae (in Spanish). Retrieved 30 January 2018. ^ "Maldito Promedio". www.elgrafico.com.ar (in Spanish). Retrieved 30 January 2018. ^ "El final de un invento argentino: los promedios dejarán de existir dentro de tres años" (in Spanish). Retrieved 30 January 2018. ^ ladiaria. "Más de lo mismo" (in Spanish). Retrieved 30 January 2018.